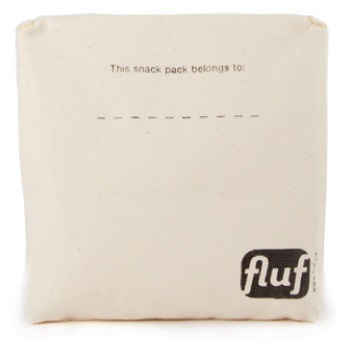 Materials: Snack Packs are made from certified organic cotton; lining is 100% polyester. Lunch containers always getting lost? This snack bag has a spot for a name! Excellent quality and the perfect size to pop into a purse or lunch bag. 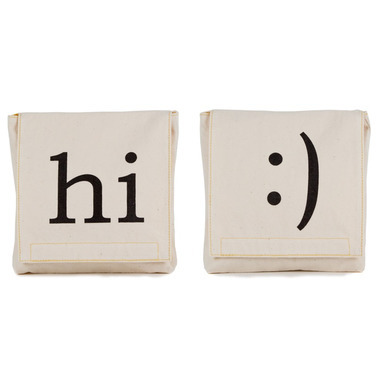 I love these snack bags. Perfect for sandwiches and other snacks. I've put two half cobs of corn, sliced oranges, popcorn, pretzels, and it is big enough to use it to store small containers to keep a snack together in my kid's school bag (eg: a container of sliced pears and a drinkable yoghurt). They wash well in the washer/dryer, but I've found that just giving them a quick rinse and maybe a little scrub with dish soap works almost as well. They dry really quickly. The velcro is starting to fluff up a bit (haha) but still stays closed. We love the ones with the cat on it, we call it the cat snack. They are a little small and the Velcro does not seem terribly strong. Also, a little on the expensive side compared to other products in this category. I bought these for my kids' school lunches. They are great. Will purchase more when they come back in stock.